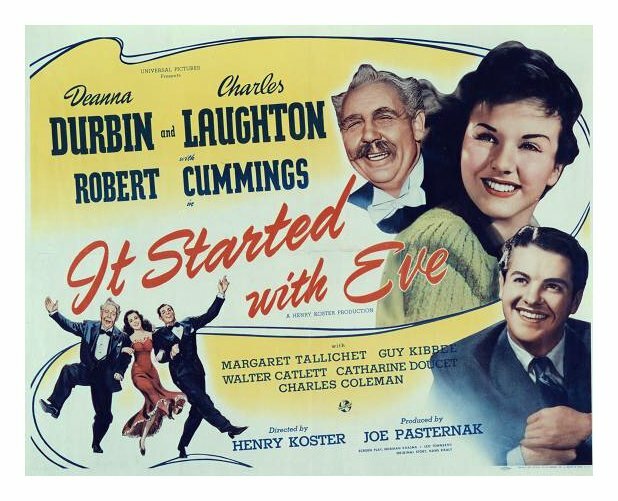 This 1941 Universal charmer is everything a romantic comedy should be. The lead characters are quick and clever. The dialogue is funny and holds up in this modern age. The romance is sweet but not too sticky. Add all of those elements together, and throw in a sprinkling of Deanna Durbin’s beautiful singing voice, and you have a must-see movie. Anne Terry (Durbin) is a hat check girl who moves to the big city with still-unrealized dreams of being a singer. Down on her luck and flat broke, she decides she must leave the city and move back home. Jonathan “Johnny” Reynolds Jr. (Cummings) is the wealthy son of an even wealthier man, Jonathan Reynolds Sr. (Laughton) who is on is death bed. It is Sr.’s dying wish to meet the girl Jr. is set to marry. Unable to find his fiancee, he pays Anne to pose as his blushing bride. Not-so-surprisingly, Sr. makes a miraculous recovery and hijinks ensues as Jr. must continue to pawn off Anne as his bride-to-be, in an effort to prevent his still-recovering father from becoming upset and falling ill again. I cannot say enough about this film. Each and every character, from the butler to the undertaker, is hilarious and perfectly cast. Deanna Durbin is absolutely charming, and it is easy to understand why she was the highest paid star in her day. This is the way romantic comedy should be done. *Scene to watch for: Any scene where Jr. is trying to deal with his actual fiancee.